College Republican member Ashley Todd is asked to leave a group of Ron Paul (R-TX) supporters in Brazos County, Texas, according to group leader Dustan Costine. According to Costine, Todd posed as a supporter of presidential candidate Mike Huckabee (R-AR) and called the local Republican committee seeking information about its campaign strategies. 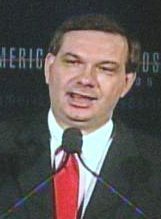 Costine will later say: “She would call the opposing campaign and pretend she was on their campaign to get information. We had to remove her because of the tactics she displayed. After that we had nothing to do with her.” Todd had earlier told the Paul group that her tires had been slashed, and campaign paraphernalia had been stolen from her car because she supported Paul. “She’s the type of person who wants to be recognized,” Costine will say. [Pittsburgh Post-Gazette, 10/24/2008] Seven months later, Todd will falsely claim to have been attacked by an Obama supporter who, she will say, carved a “B” (for “Barack”) into her cheek (see October 24, 2008).